But before I get to that there’s great news! After groveling begging and pleading inquiring nicely Courtney at Run, Courtney, Run has featured me as her “Runner Of The Week”! Yay Me! Now, back to my first experience being a race bandit. 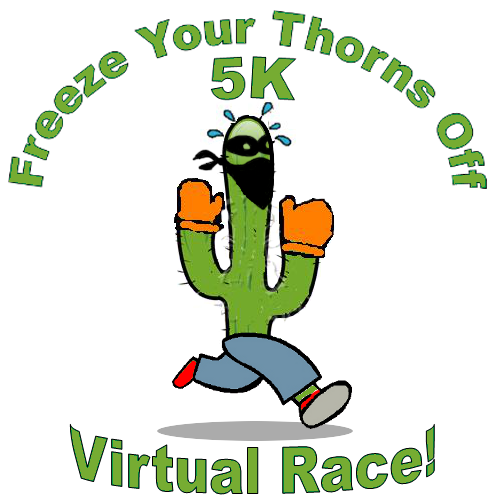 * Adam, over at I am Boring/The Boring Runner, hosted the Freeze Your Thorns Off 5K Virtual Race this weekend. The goal was to run 5 kilometres. That was pretty much it. If I had been living in Arizona I could have gone for a run with a group of people, but I don’t, so I didn’t… I meant to sign up (really I did), but I usually work on Saturdays and figured that it wouldn’t work out. I found out that I was scheduled to work on Sunday instead yet I still didn’t sign up. My excuse is that I was too lazy to let Adam know it must have sold out. Route: The figure-8 up the river, past the rec centre, up the big hill (Colin pushed the stroller, I walked – much needed hill repeats start in 4 weeks! ), along some busy roads, back to the river and home. Virtual Distance/Time: 5km in 40:46. That’s taking the first 5km since it’s a better result that the last 5. Actual Distance/Time: 13km in 1:53:24. I told Colin to remind me to bring the camera so I had proof of running, but that didn’t pan out. I barely got out the door due to my cold, we left later than we should have, and well, we have a 3 year old. The camera was on the bottom of my list and I’m pretty sure Colin had forgotten altogether. 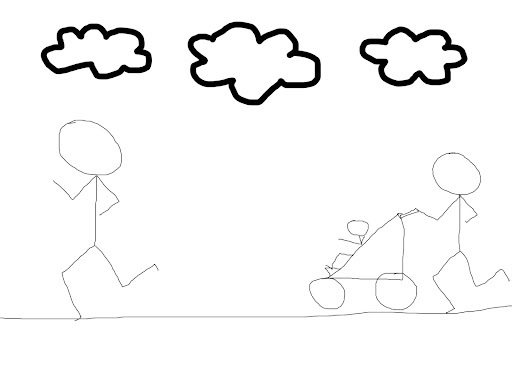 Here is my feeble artist’s rendering of our run. This was a very slow run (see reason for forgetting camera). The best thing I can say about it was that we completed it. However, I have to say Thank You to Adam because I don’t think I would have even left the house if I had not wanted to bandit his race! *I have to state here that I don’t think I’d ever actually bandit a race (not pay, but run anyways). It would seem far too much like stealing to me and I’d feel guilty if I had to look at a medal knowing that I didn’t really earn it. This entry was posted on January 10, 2011 by lovemyrunners. It was filed under Bandit, Runner of the Week, Virtual Race . I saw your interview on Run Courtney Run, very cool. I love that you bandited the virtual race… I'm not sure that's ever been done before! Great race picture… I love it!! Good job you. Good job on getting out of the house and running. I am glad no officials pulled you out of the race without registering. Wonder if Adam will accept your bandit entry. My excuse for not running is that blogger has been playing a number on me and not displaying some posts so I had no idea about the race. Way to go Alanna! Running when you've got a cold is tough, I can't imagine what it's like when you throw a 3 year old into the mix! Great interview on Courtney's site! Awesome job on the run…they all count in my opinion. Just stopping by to say Hi. Saw you over at SkinnyRunner. My husband hates the running thing too. I don't know why I even talk about it with him…actually, that's probably why I started a blog. 🙂 So, I feel your pain! Hi! Saw you on SR, I'm doing the 1000+ tall mom club too! I'm now following you. Can't wait to read more! Saw you on SR! I started my blog to hold me accountable..and it works – sometimes.